Kapil Sharma, today is the most adored and well established stand-up comedian, anchor and actor on television. He has nurtured and created his own characteristic brand of stand-up comedy. His shows give the audience a steady does of laughter and entertainment. His journey to stardom has had lots of ups and downs. Kapil was part of a theatre group in Amritsar and he moved to Delhi to continue working in plays. In his own words, ‘comedy happened to me by accident’. He worked on the Punjabi comedy show Hasde Hasande Raho on MH One. His first big break was on The Great Indian Laughter Challenge in 2007 and he won the prize money for Rs 10 lakhs on the show. He was called to do Comedy Circus which went on to become a very popular TV show. He appeared in seven seasons of the show and won all of them. After his spectacular success on Comedy Circus, , Kapil finally started his own show Comedy Nights With Kapil produced by his banner, K9 Productions. This collaboration between Kapil and Colors, the channel airing the show, worked in favour of both. Comedy Nights with Kapil is one of the most watched, loved show with high TRPs. Almost every Bollywood celebrity wants to promote their film on Kapil’s immensely popular show. From Shahrukh Khan to Kareena Kapoor, Rohit Shetty to Deepika Padukone and Ranveer Singh, Salman Khan, Madhuri Dixit and Amitabh Bachchan have appeared on Comedy Nights with Kapil to promote their movies from time to time. 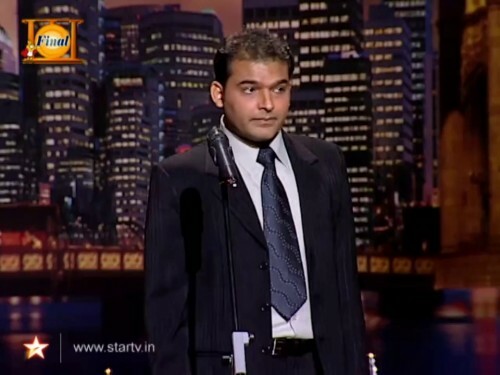 Comedy Nights with Kapil draws its parallel with British TV show The Kumars At No. 42. The basic idea of guests visiting a regular household and being quizzed is borrowed from The Kumars At No.42, but the gags are original and totally loaded with desi flavour. In one of the episode of Comedy Nights with Kapil, Kapil used the phrase, Babaji ka thullu”, and it has become the coolest slang to be used now-a-days. From humble beginnings in Amritsar, (his father was a head constable who died of cancer in 2004), today Kapil Sharma has made it to the Forbes India’s Celebrity 100 list. He secured the 93rd position in the list. Today on September 24, 2015, his debut movie, Kis Kisko Pyaar Karu will be hitting the screens. Kis Kisko Pyaar Karu, is a romantic comedy film directed by director Abbas Mustan, with Kapil in a lead role. Now, that’s coming a long way. Way to go, Kapil.